The magic of fire has fascinated people from the very beginning of time. Further, ear candling also evokes curiosity and is an effective ancient remedy in removing wax and impurities from the ear. Only natural ingredients are used. Therefore, Biosun candles are our first choice. Furthermore, they are purely organic. They act to calm, sooth and relax. A session is a great alternative to entering ear buds into the ear which only further push wax and impurities further into the canal. Accordingly, it is recommended to have a session every 6 months as part of a maintenance and well being routine. So what happens during an ear candling session? Lying on your side a biosun candle is placed in your ear canal. Next, the candle is lit which creates heat to soften the contents of the ear. You may hear a crackling sound and a chimney effect occurs where wax is drawn up into the candle. The process likewise takes place in both ears. Allow 30-minutes for this cleansing session. At the end of the session clients often like to look inside the candle. In fact, we can see how much ear wax has been ‘pulled’ from the ear. Who benefits from ear candling? A session may be beneficial in the relief of many symptoms. Relief is possible for sinus, ear ache, itchy ears, hearing difficulties, headache, irritations in the ear, sore throat and allergies. This process may relieve pressure after flying, deep sea diving or whenever the ears pressure is compromised. This could furthermore be used for preventative health therefore a 6 month routine is beneficial to everyone as a general well being routine. 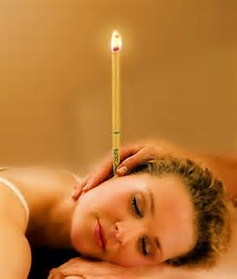 If you have not had the pleasure of trying ear candling this is for you. Come along and give it a go either on its own or preferably in our Overall Wellbeing Package. I love to work hand in hand with my clients and ensure you are in very good hands in discussing openly what you would like to achieve in our overall health during this session and ongoing times ahead. Biosun Ear Candles are certified as a Class IIb medical device. Biosun Ear Candles are listed as an Included Medical Device on the Australian Register of Therapeutic Goods (ARTG) for supply in Australia. Our ARTG registration number is 142411. This procedure is not a cure for any ailment. It is a wonderful holistic treatment. Why not give it a go!